In all of AFL/VFL history, only two teams have been minor premiers one year and then lost the first five games the following year. The first team was Richmond, which topped the ladder in 1982 but then started 1983 with five losses. The second team is the 2016 Dockers. The 1983 Tigers managed to win their sixth game, so unless the Dockers manage to win this weekend against a strong Adelaide Crows, they will have the worst record of any minor premiers ever after six rounds. 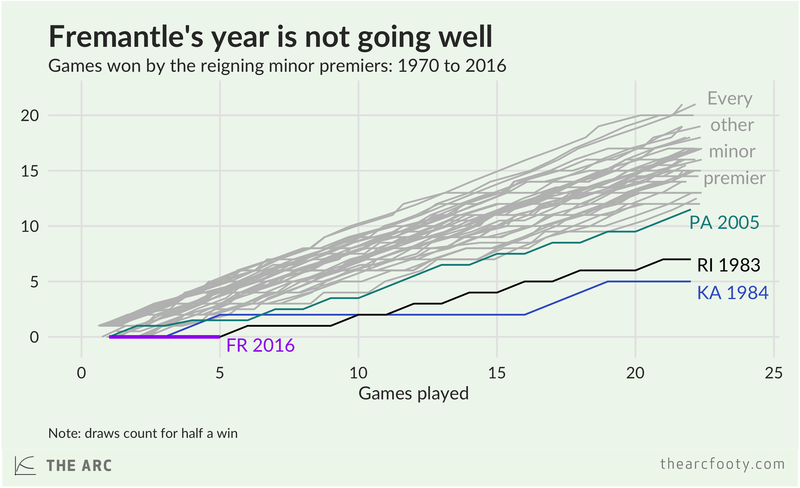 This chart shows how many games the reigning minor premiers had won at each point of the season. It includes every reigning minor premier in the AFL/VFL from 1970 onwards. Richmond went on to record seven wins in 1983. That’s not actually the worst record by a reigning minor premier – that record currently belongs to the 1984 Kangaroos, who recorded only 5 wins after topping the home-and-away ladder the year before. Can the Dockers manage to do better than those teams, or will they be setting a new record in 2016? We’ll post updates to this chart through the course of this year to keep an eye on their progress.